Ah, nostalgia. 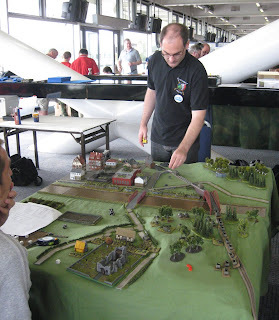 I think you'll agree nostalgia is the beating heart of Old School wargaming. Whilst I myself am quite taken by the whole Old School thing, I like to mix some new school in with the old, especially in terms of rules. So this post is a mix of Old School nostalgia with new school rules and some compromises from the School of Reality. Furthermore, I am more of a Featherstonian Old Schooler than a Grant/Young Old Schooler. 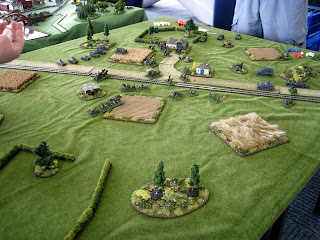 It is the Don's 1962 classic War Games which inspires me, rather than Charge! or The War Game. 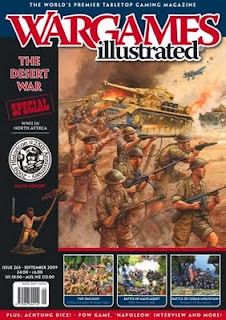 For a start, Featherstone used Airfix figures, a good number of which I owned myself at the time, and he gamed in the ACW and WW2 periods, with which I was familiar. The Seven Years War and those Spencer Smiths were a bit exotic for me in 1970, when I first started reading wargames books. And Featherstone favoured the 20 figure unit, which has always been my favourite size. Anyway, it's well past time for a bit of Donald Featherstone-inspired nostalgia on this blog. 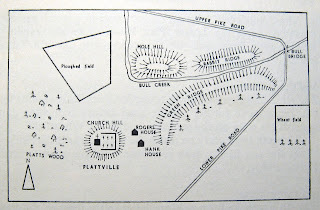 To whit, a re-fight of the horse and musket classic, 'Action in the Plattville Valley'. For those benighted miscreants who don't own a copy of War Games or are unfamiliar with the battle, I will give the basic details of the original scenario, then detail the changes I made (through choice or necessity) to complete the re-fight. Action in the Plattville Valley. The original map, copied from the book, is seen below. Table size was 8' x 5'. The original game is set in the ACW period. Each side has 6 regiments of infantry with 20 figures each, two regiments of cavalry with 15 figures each, and 2 guns. The regiments are supposedly organised into 'brigades' of two regiments each, but the rules Featherstone used have no real command and control regulations, so the regiments can operate individually or can be grouped in any way the player wishes. Two regiments of infantry from each side (the 'advance guard') enter the table on move 1, moving along their respective roads. From move 2 they may move off the roads, then at the beginning of move 4 the rest of each army (the 'main body') may deploy as required anywhere on each baseline. The scenario was therefore a fairly simple encounter battle. Forces involved were quite modest in relation to the table size. I felt that the scenario and size of forces were likely to produce a battle with plenty of potential for manoeuvre. Action in the Plattstadt Valley. I don't have access to any ACW forces, and anyway I wanted to play the game using my SYW figures. So 1863 in North America became 1757 in Central Europe. I suppose a 'true' refight would use the same rules as laid out in the book, but I had no real desire to do this. Much more to my taste was to use the Rank and File rules from Crusader Publishing. As this blog has already indicated, these have an Old School simplicity but are rather more modern in their mechanisms than Mr Featherstone's originals. I would have preferred to use an 8' x 6' table, but 6' x 6' is the best I can manage in my wargames room (alright, my dining room). Considering the size of forces in use, there should still be plenty of width. The inability of the infantry units to deploy in single line due to the basing conventions of Rank and File will help. Using the terrain pieces available to me I came up with the terrain shown on the map below, representing the closest I could get to the original. The only real point to make is regarding the river. 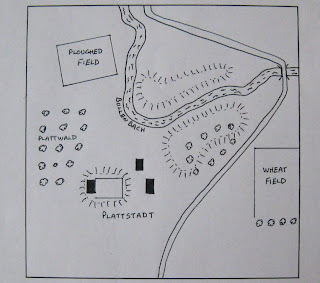 This was obviously intended to be fordable as the original game report indicates units crossing Bull Creek, so the Bullenbach is fordable throughout its length by infantry and cavalry. Artillery must use the bridge. Units lose half a move to cross. If fighting whilst crossing, they deduct 1 from any firing/melee/morale dice. Of course, I didn't make any plasticine hills or mark in the roads and rivers with chalk. But maybe that could be an Old School project for the future. 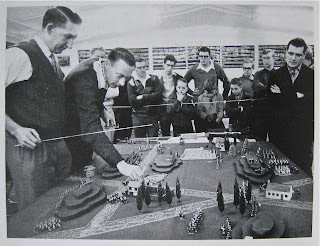 A matt-green painted board, a set of chalks, some hill contours cut from chipboard or some of the foam materials you can get nowadays... Those Old School tables could be very eye-catching, as the photo below (from Featherstone's Complete Wargaming) shows. Now that's what I call Old School. However, I definitely draw the line at the pullovers. And I'm not getting a side parting either. But I digress. This would be as per the original. Success or otherwise would be decided by using the Rank and File Army Break Point rules. These are simplicity itself: 2 points for each unit, except the guns which are 1 point each. Lose half your army points and you are in trouble. Failing that, an Old School-style gentleman's discussion would take place and a winner would be agreed upon. Each side had 6 infantry units of 5 bases/20 figures each. One of the infantry units on each side was a grenadier battalion ('veteran' in R & F), and one a lower grade unit ('green'), just for a bit of interest. Each side had 2 cavalry regiments of 5 bases/10 figures each, one of cuirassiers and one of dragoons. Two gun models (2 'batteries') per side were also present. Making the cavalry units the same size as in the original game would make them relatively too powerful when using Rank and File, so they stayed at 10 figures. 1 Commanding Brigadier (+2 bonus), 4 Colonels (+1 bonus). The terrain. View across the Bullenbach towards the wheatfield. Similar to the views in plates 6 and 9 of Featherstone's book. Plattstadt, with the Plattwald on the left and the ploughed field in the background. See plate 10 in the original book. Move 1. On the Austrian (right hand) side, the Siskovics grenadiers lead the 1st battalion of IR10 towards the bridge. On the Prussian side, grenadiers also lead, followed by the 1st battalion of IR1. Rank and File allow a triple move to columns on road outside 12" of the enemy, so initial progress was rapid. Move 2. The Prussians start to form line, but the Austrians continue in column in order to deploy on the far side of the bridge. By move 3, both advance guards had formed into line and faced each other just to the south of the bridge. Move 4. The Prussian main body has entered the game. The rules allow a double move off road outside 12" of the enemy, so once again units move forward quickly. Move 4, showing the initial move of the Austrian main body. Units from the main bodies were placed alternately on their respective baselines. Once all were in place, they moved forward their first move. Move 4 again. A cavalry clash seems likely on the Austrian right flank. The Prussian cuirassiers are just off the photo to the left. Move 5. Both sides have quickly established a battle line on opposite sides of the Bullenbach. Move 5. On the western flank, the Austrian dragoons have veered off into the Plattwald on some vague mission of encirclement (they can just be seen amongst the trees in the background). This leaves the Austrian cuirassiers outnumbered two to one, although they are supported by the 2nd battalion of IR10 who are in position behind them. The Austrian gun in the foreground is bombarding Prussian infantry just outside the photo to the left. In contrast, the Prussian gun chooses to indulge in some counter-battery fire which turned out to be very effective. Move 6. The Austrians decide to get aggressive. The Hungarians and Bavarians attack across the Bullenbach (probably a bad idea! ), whilst the two advance guard battalions in the foreground are ordered to charge the Prussian battalion to their front (1st battalion, IR1). Both Austrian advance guard units are already unsteady, but... orders are orders. Predictably, the Austrians suffer badly from fire and melee casualties and rout across the bridge at under half strength. This means they will not be returning. Move 6 on the western flank. The Austrian heavy cavalry brace for impact. (The attacking Prussians have been obliged to approach slowly if they are to maintain formation, with one squadron on the left moving through the woods and two squadrons on their right splashing through the Bullenbach). In the distance the Austrian dragoons veer away from the 2nd battalion of the Prussian IR1, who have emerged from Plattstadt to challenge them as they pass by. Move 7. The Austrian units attacking across the Bullenbach have been thrown back by Prussian musketry and return to their starting positions. The 1st battalion of IR37 (furthest away in this photo) suffered particularly badly. Move 7. The Prussian fusiliers of 2nd battalion, IR33, occupy the wall at the north end of the wheatfield, with an artillery battery in support. Move 8. The Prussian cavalry have charged with predictable results. The Austrian cuirassiers have lost 2 bases and have been forced to fall back. Move 8. On the hills overlooking the Bullenbach, the depleted Prussian infantry units stand firm. The Freikorps unit on the right is held firmly to its task by the presence of a colonel and the commanding brigadier. Move 8, and the Austrian dragoons continue on their rather pointless tour of the Prussian baseline. The attack over the Bullenbach has already failed, and there will be no opportunities to attack any Prussian infantry units in the rear. 2nd battalion, IR1 track them around the south of Plattstadt. Overview of the final positions on move 8. As in the original battle, by this stage the winner was obvious. Two Austrian battalions have been routed for good, and the Austrian gun in the centre has been destroyed by counter battery fire. All Prussian units are standing firm and are ready to continue, although some have lost one or two stands. There is also a nice gap opening up around the bridge which Prussian units are well placed to take advantage of. A Prussian victory. Well, not as much manouevre as I hoped for. A table eight foot wide would have helped, making it harder for both sides to form a coherent line. 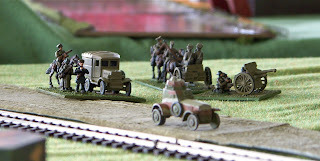 As it was, with two players familiar with SYW tactics, and rules which encourage historical play, two opposing battlelines soon appeared across the table. 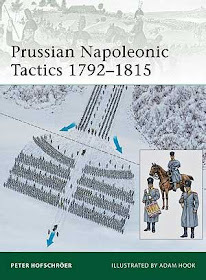 As the Austrian commander, my attack across the Bullenbach and the detachment of the dragoons were both attempts to shake things up a bit, but neither had much chance of doing so. A better option would have been a Frederican plan to refuse one flank and load up the other in order to create a breakthrough. However, deployments on both sides were conservative and this option was not explored by either side. Maybe next time. One key to victory might be to get your advanced guard to occupy the hills on the enemy side of the Bullenbach early on. However, this would be easier said than done with your opponent on the lookout for any such move. The Rank and File rules continue to impress. They are free flowing and simple to use, but retain all the necessary period flavour. Comments welcomed as usual. (Apologies to the four gentlemen who posted responses soon after this report was published. Gremlins got into the system and the blog was deleted, so it has had to be re-done).